So there I was...reading my email. Click, click, click, delete, spam, save, reply. And up comes an email from a chick named Amber. I could tell she was a blog reader and interested in being featured on my "Mothers Helping Mothers Monday" posts. But to be honest, I didn't have the time to read it. I'm lucky if I have to the time to put on a bra (or at least do it without stumbling over my ankle-loving monkey daughter). So I put off reading it. But let me tell you, that was a big mistake. Why? Because once I FINALLY got around to sorting through my email again, I was laughing out loud at this total stranger. Her email was a total treat. She linked me to her newly launched blog and it's darling. It's a blog about everything and nothing. Amber and her friend, Ashley, are just two normal/crazy/insane/kind/funny/stressed moms who do a wonderful job looking at the silly side of life. Not to mention, I absolutely love the design. So let's help a mutha out. 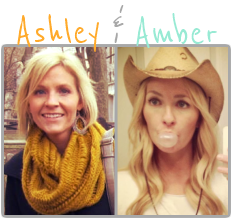 Let's show Ashley and Amber some blog lovin'. Go to their blog and click around. Have a few laughs. Subscribe if you feel like it. Stalk them on Instagram. Whatever floats your boat. I have to tell you that I have been really down on myself lately. I promise you that 85% of my friends live in amazing homes or own their own small business or have the wardrobe of a movie star (OK...maybe just a few people I only kind of know who I follow on Instagram). These are things that really "don't matter". They just don't. BUT...I can't handle the blogs that are all about fashion and beauty and they have 5 million followers who want to know what the greatest t-shirt in the world is. And they are making real money off of this stuff. I have to step away from it. So I am the other half of Ashley & Amber..and can I tell you how much this little shout-out means to us newbies on the blogging block? A billion times a million thanks! We sure appreciate it and love your blog as well. You my friend, are a gem for sure! I'm just gonna give a big ole' second to Ashley's comment above. Sometimes in the blogging world (which is a tiny bit sick and twisted I've decided) we need a day where every single person who takes a looksie into our little blog on the block needs to leave us some love and it never happens! Consider this gal repenting! I will be sharing the love more often to those in the planet that opt to pour their hearts out online. Starting right here at Hope Smiling Brightly. Muah!